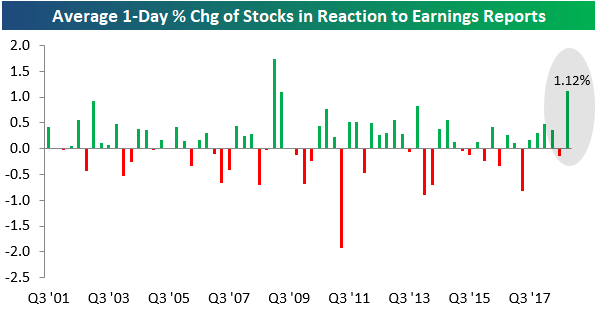 Stocks have been reacting very positively to their earnings reports so far this season. As shown below, the average stock that has reported earnings this season (since January 10th) has gained 1.12% on its earnings reaction day. Earnings season is still not even halfway complete, but if these type of gains continue, it would be the most positive season since the Q1 2009 and Q2 2009 reporting periods that ran from April 2009 through August 2009. If you remember 2009, that was the start of the bull market when the S&P 500 exploded higher off of the Financial Crisis lows. The strength this earnings season comes from earnings beats performing well and earnings misses not falling as much as usual. As shown in the chart and table below, the average stock that has beaten EPS estimates this season has gained 2.64% on its earnings reaction day, while the average miss has fallen just 1.92%. It’s extremely rare to see companies that beat go up more than companies that miss go down. Enjoy it while it lasts, because this type of action won’t last forever. We’ve never gone a full year with this being the case, as is shown below. The one-day price change for stocks that beat or miss EPS estimates has been very consistent on a year-to-year basis over time. Generally speaking, a stock that beats will gain 1.9% on its earnings reaction day, while a stock that misses will fall 3.5%. Just have a look at the performance of beats and misses from year-to-year and see how consistent these numbers are. Below we show how stocks are performing on their earnings reaction days this season by sector. Technology stocks are catching a huge bid after they release Q4 results with an average gain of 2.41% on their earnings reaction days. Consumer Staples and Consumer Discretionary stocks are the next best performers, followed by Communication Services and Financials. The only two sectors where stocks aren’t reacting positively to their Q4 earnings results are Energy and Real Estate. The average Energy stock has traded exactly flat on its earnings reaction day this season, while the average Real Estate stock has fallen 0.49%. Every other sector is averaging gains.